Wikimedia Commons has media related to 1687. 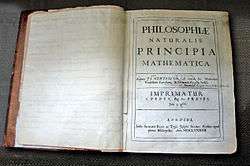 Newton's own copy of his July 5th 1687 edition of Philosophiæ Naturalis Principia Mathematica (or his Principia), with hand-written corrections for the second edition. 1687 (MDCLXXXVII) was a common year starting on Wednesday (dominical letter E) of the Gregorian calendar and a common year starting on Saturday (dominical letter B) of the Julian calendar, the 1687th year of the Common Era (CE) and Anno Domini (AD) designations, the 687th year of the 2nd millennium, the 87th year of the 17th century, and the 8th year of the 1680s decade. As of the start of 1687, the Gregorian calendar was 10 days ahead of the Julian calendar, which remained in localized use until 1918. March 19 – The men under explorer Robert Cavelier, Sieur de La Salle, murder him while searching for the mouth of the Mississippi River. April 4 – King James II of England issues the Declaration of Indulgence (or Declaration for the Liberty of Conscience), suspending laws against Roman Catholics and nonconformists. 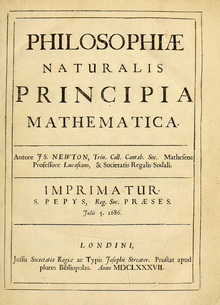 July 5 – Isaac Newton's Philosophiæ Naturalis Principia Mathematica, known as the Principia, is published by the Royal Society of London. In it, Newton describes his theory of universal gravitation, explains the laws of mechanics and gives a formula for the speed of sound. The writing of Principia Mathematica ushers in a tidal wave of changes in thought, significantly accelerating the scientific revolution by providing new and practical intellectual tools and becomes the foundation of modern physics. August 12 – Battle of Mohács (Great Turkish War): The Habsburg imperial army and allies under Charles V, Duke of Lorraine, defeat the Ottoman Turks and enables Austria to conquer most of Ottoman-occupied Hungary. September – The navy of the Republic of Venice raids the Dalmatian coast and attacks Ottoman Turkish strongholds in Greece as part of the Morean War. On 28 September, the Parthenon in Athens is badly damaged when Venetian mortar fire explodes a Turkish powder magazine housed in the building. November 8 – Suleiman II (d. 1691) succeeds the deposed Mehmed IV as Ottoman Emperor. December 31 – In response to the revocation of the Edict of Nantes in 1685, a group of Huguenots set sail from France and settle in the recently established Dutch colony at the Cape of Good Hope where, using their native skills, they establish the first South African vineyards. ↑ Palmer, Alan; Veronica (1992). The Chronology of British History. London: Century Ltd. pp. 196–197. ISBN 0-7126-5616-2.